The S. Click here to play! W.A.T. team is in desperate need of your help. Aid them in taking out the bad bugs and you will be rewarded handsomely for your services. Once you join S.W.A.T. you won't want to leave! S.W.A.T. Team is a thrilling 3-reel slot played across a single pay line. As a traditional slot machine, you can enjoy the ease of play, and simplicity of winning. The SWAT Team logo is Wild and can be substituted for any other symbol on the reels in order to complete a winning payout. Additionally, any time you complete a combo with the SWAT Team logo, the payouts will double (if one is used) or quadruple (if two are used). And if you manage all three Wilds across the pay line, you will receive a hefty sum of 1600 times your initial pay out. The S.W.A.T. Team needs you help, so help capture the bad guys before it's too late! 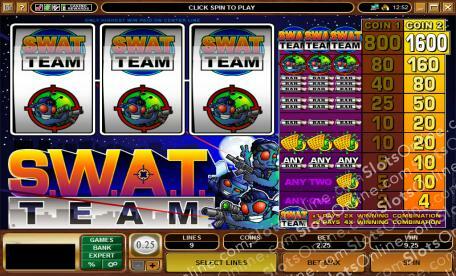 The SWAT Team logo is Wild and can be substituted for any other symbol on the reels to complete a winning combination. Payouts of up to 1600 coins can be won.